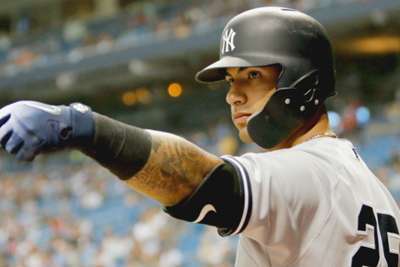 The New York Yankees set a MLB record for home runs in a season when rookie second baseman Gleyber Torres hit a two-run homer in the second inning against the Boston Red Sox. The Yankees' 265th homer moved them ahead of the 1997 Seattle Mariners, whom New York had tied with four homers on Friday. New York's power is not limited to one player. The Yankees have hit 20 or more homers from every spot in the batting order, and six players have tallied at least 24 home runs this season. Torres' 24th homer helped push the Yankees beat the Red Sox 8-5 on Saturday. The Yankees close out the regular season in Boston on Sunday.